The X-Men-Weezer connection: Does it go deeper than 'In The Garage'? – AiPT! Is Weezer’s Rivers Cuomo… an X-Fan? Let’s look at the evidence. Since their debut in 1963, the X-Men have sworn to protect a world that hates and fears them. But you know what? Here at AiPT!, we’ve got nothing but love for Marvel’s mighty mutants! To celebrate the long-awaited return of Uncanny X-Men, AiPT! Brings you UNCANNY X-MONTH: 30 days of original X-Men content. Hope you survive the experience… The X-Men and music. Nope, I’m not talking about the ’90s animated series’ gnarly theme song or composer John Ottman’s soaring film score–though both are awesome. I’m talking about rock and roll, man! When a franchise like the X-Men has been around for over 50 years, it’s a given at least a few of its many iconic characters would find their way into popular music. Like, remember back in the ’70s when Paul McCartney and Wings released a song titled “Magneto and Titanium Man” about… Magneto and Titanium Man? Yeah, I can’t believe that’s a thing that happened either! Had this song never made it onto “The Blue Album,” it’s likely Weezer would still go on to become my favorite band, as I can’t not love frontman Rivers Cuomo’s melodies (please save your pointed “Raditude” comments until the end of the article). But Cuomo singing about Kitty and Kurt? Well, that just sealed the deal for high school Chris, who also happened to already be a die-hard X-Fan. As is the case for many individuals of the geeky persuasion, I’m sure, it’s hard to have just one interest to obsess over. So, just as I devoured everything X-Men, I made room in my life for all things Weezer as well. Except, instead of digging through long boxes at my local comic shop for dusty gems and raw nuggets, I was cruising file-sharing sites in search of Weezer rarities and obscure Cuomo demos (of which, there are so, so many). Over time, in my Weezer travels, I got to learn more about Cuomo and how he wasn’t just tossing X-Men references into his songs because his Catalog of Riffs told him to–the man genuinely appreciated comics! And maybe–just maybe–was an X-Men fan like myself. I’ll dig into my X-theories in a bit (it’s Uncanny X-Month, so i’m contractually obligated to), but first, some background on Cuomo and Weezer’s ties to comics culture. For starters, there was the superhero girls poster that many Weezer fans no doubt had on their bedroom walls (I, sadly, was never one of them). The poster was illustrated by the ultra-talented cartoonist Adrian Tomine, perhaps best known for writing and drawing Drawn & Quarterly’s Optic Nerve series (which I discovered through that poster–thanks, Weezer!). “I’m fanatical about cartoons from Toronto–love comics” Cuomo said in a 1996 interview with Canada’s MuchMusic. Specifically, Cuomo was all about the work of another Drawn & Quarterly cartoonist in the mid-90s–Joe Matt, famous for his autobiographical series Peepshow. And while it’s more common for music fans to talk about how Cuomo’s feelings of isolation while attending Harvard University during the bitter Boston winter helped shape Weezer’s emotional sophomore album, the songwriter used to be quite open about Matt’s influence on the record, as evidenced in this MuchMusic clip where he comments on his “inner Pinkerton” (5:10). “Pinkerton is a womanizing rockstar type of character, which, I wasn’t even really aware that I had in me until I started reading Joe Matt comics,” Cuomo said. The singer was such a big fan of Peepshow, he even penned a letter to the creator and went on to conduct an interview with Matt in 1997 (Rivers, you’re welcome to contribute to AiPT! anytime!). Now, much to the chagrin of many old-school Weezer fans, Cuomo has really calmed down from his “inner Pinkerton” days. And he doesn’t really talk much about comics anymore–indie or otherwise. But, for the Weezer-X-Men crossover fans like myself, there have been a few bits of evidence here and there that make me think modern Cuomo’s just as much of an X-Men fan as he was when growing up and rocking out in the garage. No? Well, then let me deliver my final piece of evidence in my attempt to prove Cuomo is an X-Fan at heart. This is a picture I remember seeing online long ago (that took quite a bit of online digging to track down), following the first Weezer Cruise back in February 2014. While I didn’t cruise to an island in the sun with the band and their fans, I do know that the final night at sea was “Superhero Night!” Yes, Cuomo was there, and yes, he dressed up as a specific superhero. Any guesses as to who it was? Can I get a drumroll, Rivers? Yep. 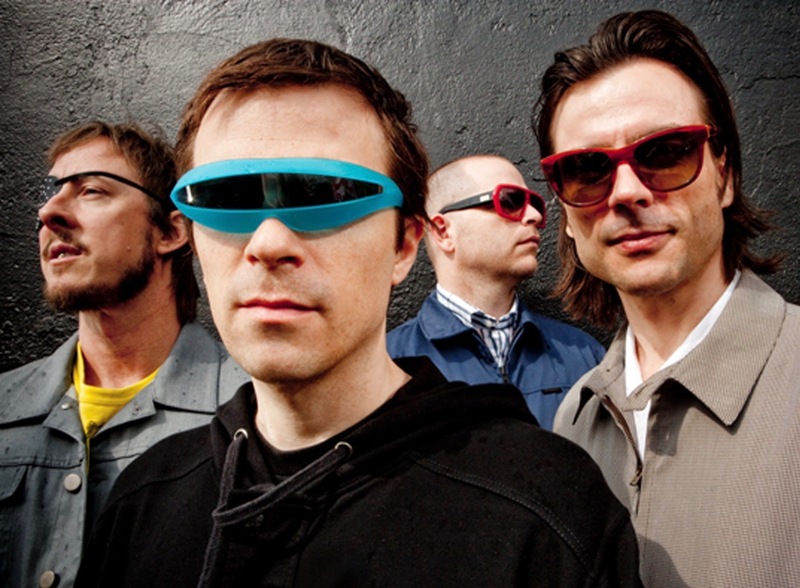 That, my friends, is Rivers Cuomo dressed as the X-Men’s Cyclops. Cuomo has been all about rocking silly costumes while performing in recent years, but why hasn’t he thrown on the ruby quartz visor for a song or two? Hell, make it a live performance of “The Girl Got Hot” and I may just learn to love that song. Seriously, though, I love Weezer and I love X-Men. I have no idea how much Cuomo (or Pat Wilson, Brian Bell and Scott Shriner) actually care about Marvel’s mighty mutants. But I wouldn’t be much of a fan if I didn’t secretly wish there was more to all these funny coincidences. You know, like the fact that we got “Can’t Knock The Hustle,” the first single off of Weezer’s upcoming “Black Album” in the same month we got five issues of X-Men Black. And hey, what if “Pinkerton’s” “Pink Triangle” was actually a sequel to “In The Garage,” and that “sweet in floral prints” with the pink triangle on her sleeve that Cuomo was heartbroken over was actually Kitty Pryde? Chris Claremont and many X-Fans would likely approve. Yes, Rivers, you have our permission to share this image on Instagram.